Known: as a realist/Impressionist painter of Southwestern Indians. Studied: American Academy of Art in Chicago and in two years won 22 awards. Exhibited: Allied Artists Show in New York, and the Indianapolis Hoosier Salon, The Gene Autry Museum of Western Heritage show, “The China Experience”, a Western Art exhibit that traveled to Peking, China in 1981. One of is paintings was selected as an official poster for the China Exhibition. Taught: instructor at the American Academy of Art in Chicago where he taught for six years. Awards: John F. and Anna Lee Stacey Scholarship Fund, Indianapolis Hoosier Salon, where he was awarded first place in the figures and portraits. 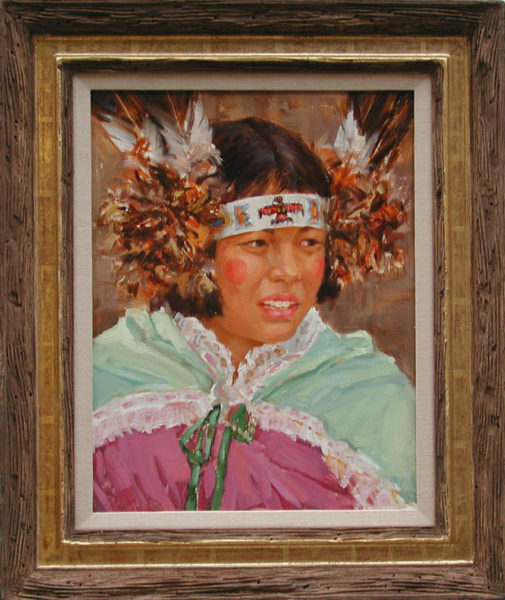 Desatnick is known as a realist/Impressionist painter of Southwestern Indians. He is inspired by their beauty, character, and simplicity of life which harmonizes with nature. Comments This painting is in excellent condition in the original frame, also in excellent condition.